So there’s been another ResearchEd. This time a smaller affair and the first of what looks like many regional conferences; bringing researchers and educational professionals together to look at what everyone can do to make an impact. I have to say, despite the fact that we didn’t have to get up before 5am this time and there was an official break for lunch, by the end of the day I felt as if my brain was full and I’d suffered a bombardment of information. I’m pretty sure this is all down to timing though – September’s was after 5 weeks away from work with a graduation to look forward to, this one was after a hectic term with two (ridiculous) days left of next week before the Easter holiday! Another difference was that I helped out at this one. I say helped, Helene Galdin-O’Shea is some sort of Goddess that seemed to have everything smoothly under control, and my duties really only stretched to pointing cameras in the right direction and pointing some people to the loos. She even didn’t mind that I wasn’t keen on introducing speakers in front of the crowd. I was particularly pleased to be filming Richard Churches’ session as I am currently leading the Closing The Gap: Test and Learn trial at our school. Again, I say leading, we were assigned Lesson Study which is currently being piloted so I haven’t had to do much so far, but I’m sure I’ll be snowed under by September! Dr Lee Elliot Major and James Richardson looked at how the Education Endowment Foundation (EEF) is producing research and perhaps more importantly, how it is embedding this into schools. One of the first things that was mentioned was that the work of the EEF was never intended to be about accountability and I was happy about this. One of the problems with (education) research is that people like something if it fits their agenda but are more reluctant when it starts to challenge the things they’ve invested time and money into and there’s little critical evaluation of what is being used. Research evolves and is questioned and I think quite often, not just in education, the prefix ‘Research shows that…’ makes for a convenient qualifier to whatever comes next. I want an opportunity to see that evidence and make my own mind up. Obviously when it comes to something like Teaching Assistants the issue can quickly become very emotive and it’s a shame to hear stories of sweeping personnel decisions being put down to findings that are meant to start a conversation and inform the development of further research. On that note, it would be great if the EEF Toolkit could be used to help guide TA deployment in a more effective way. A major focus of this session was they use their data to understand how different methods are used in real schools. How direct does instruction have to be (including levels of support) and what happens if you deviate from the model? Interestingly, their results show that whilst pupils made significant gains on the Catch Up Numeracy programme, pupils receiving unstructured 1-1 TA support made even greater progress. Another one for the ‘deploy TAs properly and get results’ bank. The other thing to mention is a plug for the EEF DIY Evaluation Guide to use with small scale investigations. Currently in pdf form, soon to be interactive. I was filming Susanna Greenwood and Stuart Mathers, the guys from the DfE, so didn’t make any notes and was slightly more concerned about whether the battery would last on the camera than making sure I took everything in. Having said that, half the session was a more interactive experience allowing people to look at synopses of research carried out by the DfE and discuss them. Post-it notes and everything. I’ve read accounts from people that make it sound heated and tense. I’m not sure it was quite that bad – more a case of people not quite saying what was on their mind! The thing that’s stuck with me from this one was an audience suggestion that the DfE shouldn’t set its own research questions and I very much agreed with him. The example given was the question of ‘How academies work’ which infers that they do work and a better question is perhaps ‘Do academies work?’. There will always be a bias towards current policy that could be reduced with independent input. Sarah Kitchen and Amy Skipp were from NatCen Social Research and are part of the Children and Young People team. Schools should know about these people but I don’t suspect they do. They are the people who do those surveys that then get quoted and everyone says ‘Well they didn’t ask me what I thought’. The thing is, they might! They explained how they work and the obstacles they have come across working with schools, and asked for suggestions as to how they could make it easier for schools to take part. My favourite suggestion was offering something back to schools in the form of time. Payments and rewards can only go so far but I really think schools would jump at the chance to have someone come in to talk to pupils or offer work experience. Another important thing is maybe to publicise themselves more because I think so many people are wary of seemingly random phone calls that it would just be nice to know these people are real and not cold callers. Might see if we can get our names on their lists (it’s the sort of thing a self-titled research champion would do I think). We had lunch after this. A treat for those of us at ResearchEd 2013. 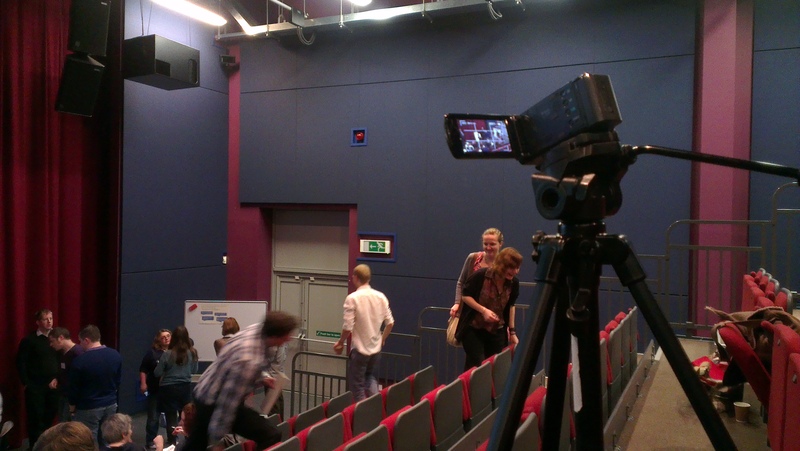 I could quite happily have had a nap after lunch – so much information for my tiny brain to process, but I had filming duties to perform and perform them I did. 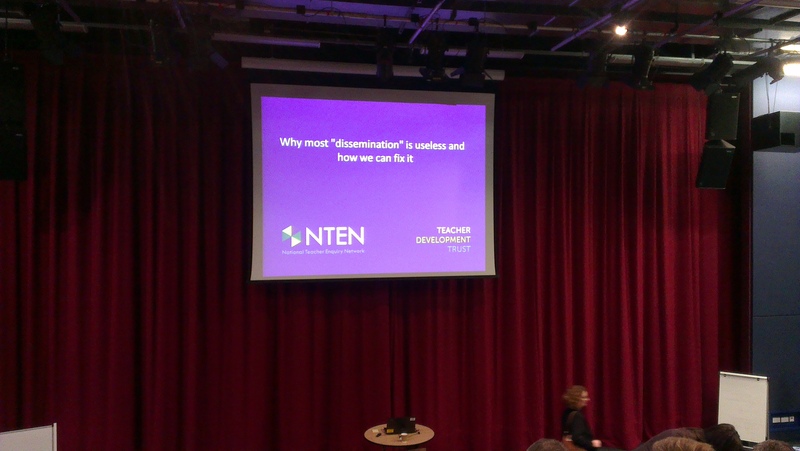 I was eager to hear what David Weston was going to say about dissemination. After all, I want to effectively disseminate all this research stuff don’t I? The crux of it all was pretty much that we spend so much time ensuring information is disseminated well to pupils, and yet as professionals, we regularly have to sit through sessions that we haven’t particularly chosen and all nod off in. Keeping it relevant, differentiating, clear learning outcomes and following up are things we all want to do in the classroom and we just have to learn to do that as staff. Sounds obvious I suppose but I suspect the dissemination of this one will be a bit more tricky. I think it may be a case of email a link to the session to management and duck. Having said that, it may well help shape my entries on the school’s Staff Share blog and when it comes to kicking off our Lesson Study next year I may need all the dissemination advice I can get! So, speaking of Lesson Study, the next session I went to was by Philippa Cordingley from Curee who is currently running the Lesson Study pilot for Closing The Gap: Test and Learn. Had I not been filming the next session I would have spoken to her about it all but I didn’t get the opportunity which is a shame. The discussion was looking at the differences between strong and exceptional schools with a high number of vulnerable pupils. The presentation is available here so I won’t regurgitate it unnecessarily. There was a small opportunity to explore some of the questions in small groups and some interesting points about cross-school models of pedagogy and the use of performance management. Our group discussed how performance management and CPD needs to be a working programme that develops alongside staff rather than simply ticking boxes. I seemed unusual in the group that our school practically pushes us to do CPD and it is a key part of our working life. I felt quite proud that most of the things that were talked about are features of our school – or rather, I recognised them as features of when our school is at its best. Staff working together, from office to teachers, TAs, management, with a consistent message to the pupils; support in behaviour management, using staff subject knowledge to benefit pupils and working with other organisations. Obviously there are always things we can improve but it is good to know that what we do as a matter of instinct has some grounding in evidence. The most contentious issue was around rigorous and systematic performance management with high stakes accountability. The idea of getting rid of staff who don’t live up to the exceptional expectations was difficult to agree with and I think it would be good to have more detailed information on this process. Last up was Richard Churches, Principle Adviser for Research and Evidence Based Practice at CfBT Education Trust and Technical Director for NCTL’s Closing The Gap: Test and Learn. He was keen to show everyone that it’s possible to conduct valuable research in school setting with only a small amount of correctly placed knowledge. Again, I was filming this session so I didn’t make any notes but I did speak to Richard Churches through the day and at the end of his presentation. The session started with a small audience based RCT with statistical analysis before our very eyes – a demonstration that it’s not difficult to do these things and you don’t need hundreds of participants or 18 months to do something worthwhile. The session included a number or real research questions and designs from schools which showed the range of opportunities and practical ways to go about it. The most important messages were that the design of a study – small-scale or otherwise – is important. Sometimes an RCT isn’t the best design and if schools are going to conduct their own research they need to be aware of a range of approaches and methods. The other key message was about the use of statistical analysis when data has been gathered. Schools with Psychology departments may have access to programmes such as SPSS to help with data analysis and there are add-ons for spreadsheet applications like Microsoft Excel. It’s still a bit daunting though – I have Psychology degree and all the terms are familiar but I haven’t used those skills in any depth for nearly 12 years now and I think there’s a gap in the market for a way to help people out and encourage rather than scare off. Quite a lot to think about there then. The videos etc. should be working their way online soon. I was happy that there was a bit more of a mention of TAs this time round. I really believe that there is an upward trend in TAs that have degrees or are qualified teachers. I hear about lots of people leaving teaching due to the stresses and workload but still wanting to work in the classroom. I overheard someone talking in between sessions about being a TA and not wanting to do teacher training for those very reasons – I’m not alone! All this means that there is likely to be an increasing hunger amongst TAs to be involved in research and development of the programmes they are delivering. I mentioned in my post about ResearchEd 2013 that it can be difficult to go back into school and not sound like the nobber going on about research when educational research still has a mixed reputation. Add to that the fact that even though we have a reasonably level playing field across staff in school, I’m still a TA trying to give advice to experienced teachers and I have to respect that feeling that no-one wants to be told there’s a better way. Another barrier to this is that even at the conference there was, with some attendees, a sense of righteousness at being there – making over complicated statements and trying to sound intelligent when it’s not necessary. The whole point of this for me is getting rid of the barriers and that means it’s for everyone. It’s OK to say you can’t remember what a one way ANOVA is. I can’t. These attitudes are why you face a barrier in school when you go back and say you’ve been on a course. I would like to hope that people are starting to get the courage to get involved in carrying out their own studies. Howard got annoyed when he overheard a couple saying ‘Well they should do some research on…’ and wanted to scream at them that the whole point is that they can do it themselves! (I say scream, I mean in a manly way. He also learnt the word pedagogy during the day). We need to look at ways to help people do this and do it properly. We need to teach people how to critically analyse research but we desperately need to have research available. It’s great to have selective summaries available but there are biases attached to that and people should be able to get hold of the primary sources if they want to. Every time a publisher makes papers available for free I save them just in case. I ask my Dad to access papers now and again and I’ve been known to email researchers themselves for information but it’s not good enough. Comprehensive subscriptions are expensive and schools aren’t going to pay for that. Maybe there could be some sort of limited subscriptions available? I wondered if there could be a central subscriber with members like the Open University? I want to be able to dip in and see what’s been published. I want to check the sources that get thrust at me with the latest big thing. There isn’t always the time or inclination but I want the option. Maybe that’s my mission. Anyway. There’s another regional conference in York next month (not going to that one, off to see Vikings) and the national ResearchEd conference in London in September (got my ticket and pencilled in to help already). It looks like this is all turning into a mega-movement and I like being part of it. Hopefully more and more people will be part of it too.